Frisko has hips A, is free at his eyes and vWD-free. Han is also Cardiotested free. 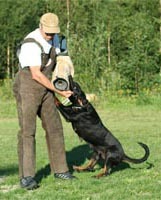 Frisko works in germay as security dog (personal protection). 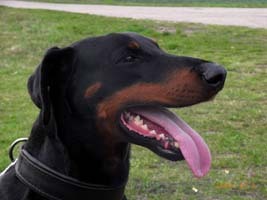 Frisko is a dog with good nerves, great fighting spirit and the same kind of dog as in our P-litter. 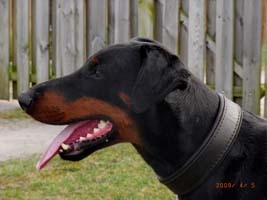 Friskos dad was also security dog and in his pedigree there is a lot of well-known working dogs. and Friskos mother. 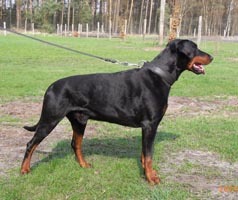 That also include breeding at Cora von Mooreiche, Asco och Gina von Weiermühle. 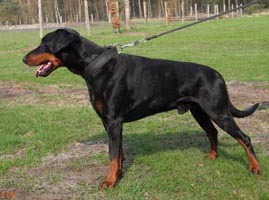 Aska is seven years old and PHTVL/PHTV free, has B at hips and vWD-fri. Her neck is X-rayed without deformations. 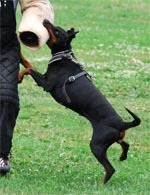 Aska is social with dogs, children and adult people. She is a very good mother. 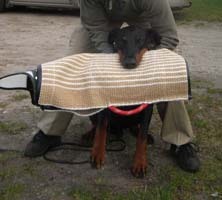 Aska has passed the Swedich policedog test and work as guard dog (personal protection). 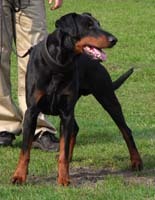 Aska become 3:rd at Swedish Mastership for dobermann. She is Korad with 223 points (high level) . Grim-Keepers C-litter and our V-litter. 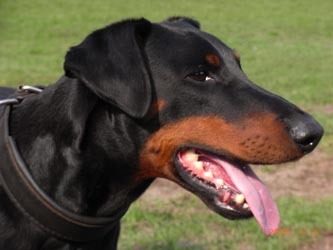 Aska descended from generations of breeding for police dogs and high performance sport dogs. Aska father Qvinz was IDC-IPO-WM participant 1999 & 2000 and Nordic Mastership 1999. 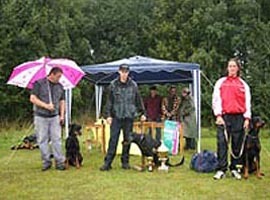 Qvinz mother, grandmother and grandfather participated at Swedish Mastership 1992, -93 & -98.
guard dogs (personal protection). His grandfathers father was policedog in Norway. and was IDC-IPO-WM participant 2003. 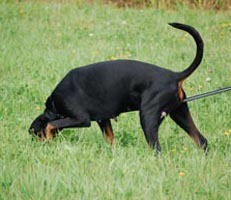 Queenie comes from Weiermühle dogs, well known for their working qualities. Askas grandmothers mother Kleo was policedog and won IDC-IPO-WM 1996. 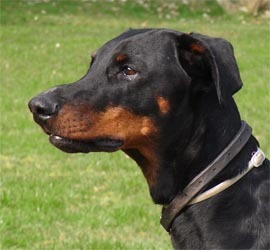 Askas brother Aldo won the Swedish Mastership for dobermann 2005 & -06.